Washers, dryers, refrigerators, and toasters: these appliances aren’t items that most people get excited about. For the most part, we’re just happy if they work properly — much less offer Wifi. But some unique appliances are turning heads with creative designs, smart features, and more connectivity than ever before. We’ve found washers you can control with your smart phone, bladeless fans, miniature breweries and donut factories, all in one kitchen appliances, smart pans, and so much more. Read on to discover more than 50 of the most creative and unique appliances available for your home today. Want your toast to look like more than, well, toast? 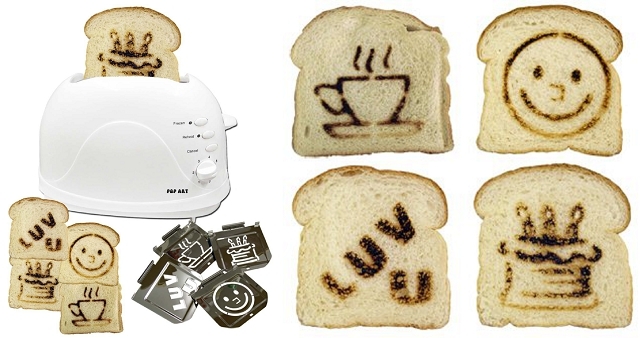 This toaster comes with stencil plates that will create patterns on the side of your toast to brighten up your morning. 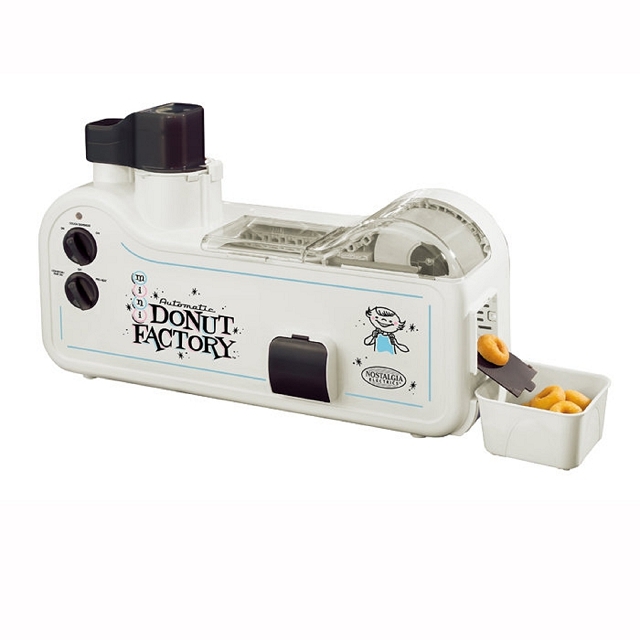 If you need tiny donuts at home in a hurry, this mini donut factory is for you. It churns out 30 cute donuts per batch, which you can decorate or eat plain for a bite size sweet snack. 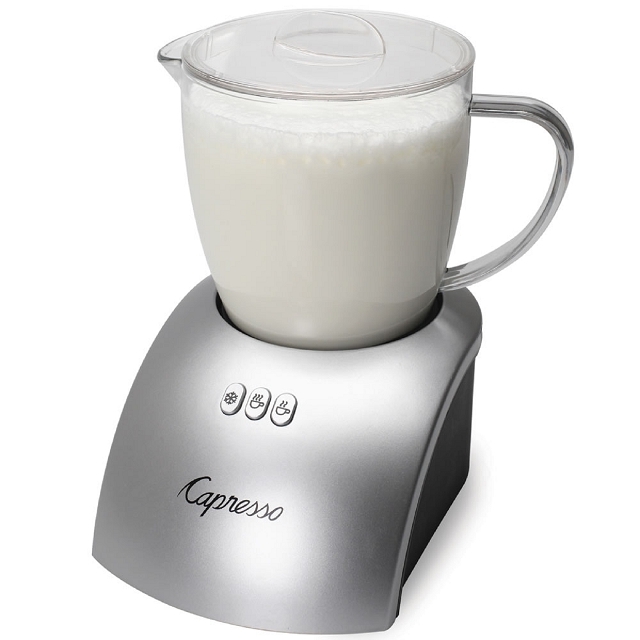 If you regularly enjoy cappuchinos or lattes at home, this milk frother can make the final step a breeze. This milk frother creates 8 ounces of cold, warm, or hot froth in a snap. 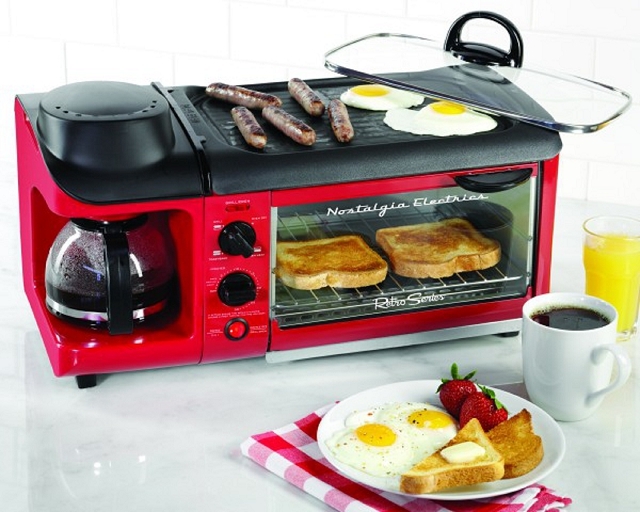 The Oven Central is an all in one cooking appliance. It’s able to bake, roast, steam, and toast a variety of foods. It comes with a number of accessories, including muffin tins, roasting racks, and kebabs. There’s also a timer for hands free cooking. 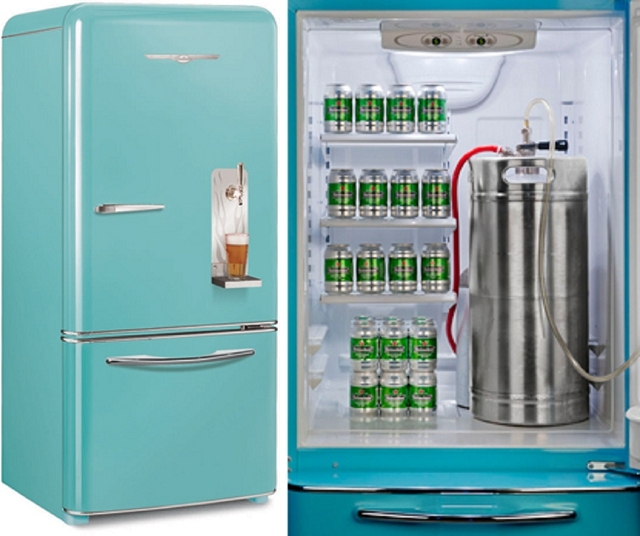 Outfitted with a BrewMaster draft system, this refrigerator allows you to store a slim keg inside and enjoy beer from the tap on the refrigerator door. Plus, there’s still plenty of room for food inside — or more importantly, extra beer in case the keg runs out. Cooking with fresh herbs is a great way to enhance the flavor of any dish. The only thing is, herbs often wilt quickly. Unless you have a garden to pick from, it’s tough to keep fresh herbs on hand. 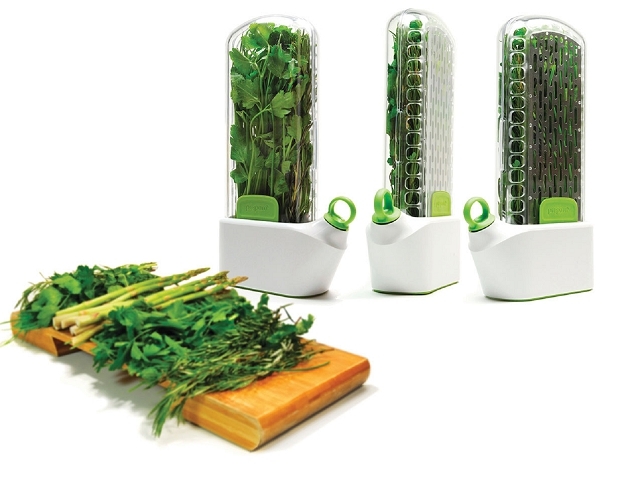 But this herb saver will help keep herbs fresh and flavorful for up to three weeks in the refrigerator. 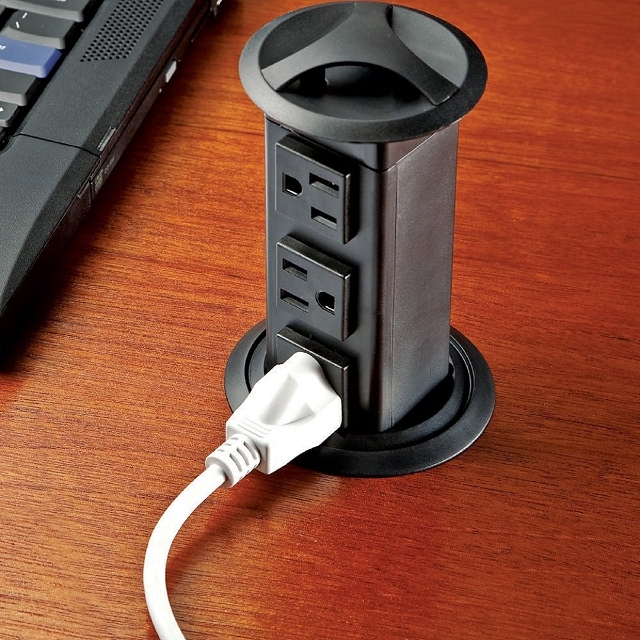 Counter or tabletop work space is often at a premium, and outlet strips can really get in the way. This outlet station pulls up from beneath the counter top, then hides away for more open space when you don’t need it. 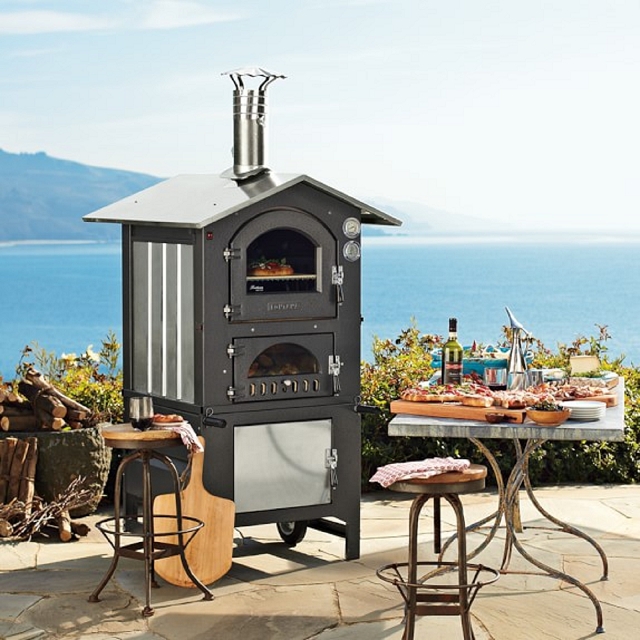 Take your cooking outdoors and the flavor of your dishes to a new level with this cast iron wood fired outdoor oven. You can bake pizzas, meat, vegetables, and more. This oven comes with a thermometer to let you know when it’s reached your desired temperature, plus a built in timer to let you know when your food is ready. Bring wood burning cooking indoors with this oven and cooktop that uses wood for heat. This deluxe fridge isn’t just a refrigerator. It’s a pantry, storage area, and even has space for a coffee maker, oven, and ice maker. Oh, and it’s made of wood, so it looks more like furniture than an average kitchen appliance. Create the perfect personal sized pie with this pie maker. 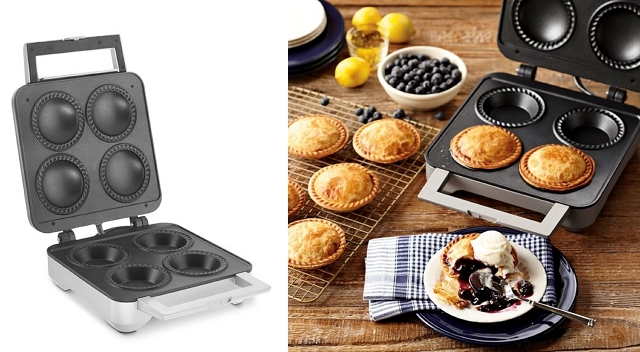 You can make up to four individually sized pies at once with perfectly sealed edges and a ready light that tells you when the pie maker is the perfect temperature for baking. Getting breakfast going in the morning often requires a lot of juggling, but you can do it all in one spot with this handy appliance. 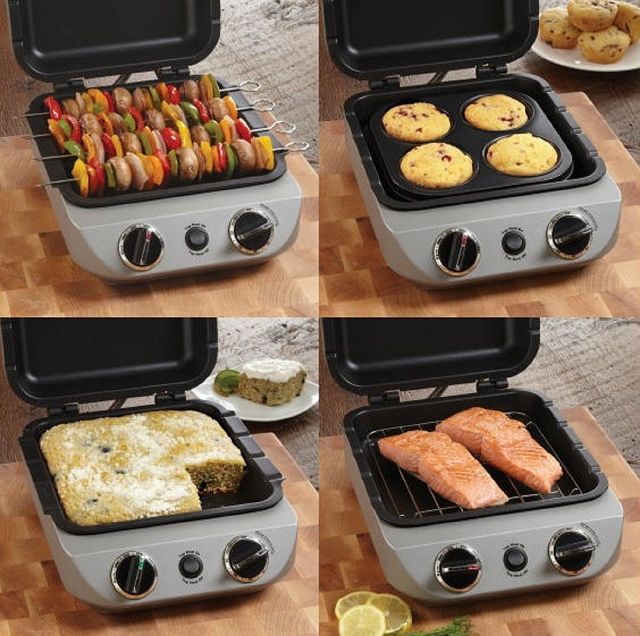 It makes toast and coffee while cooking eggs, meat, and anything else you desire on the griddle. Perfect for someone who wants a real breakfast without spending a lot of time making it. Need some extra fridge space? These cool drawers fit under your counter tops to provide additional refrigerated space for drinks, fruits and vegetables, and more. 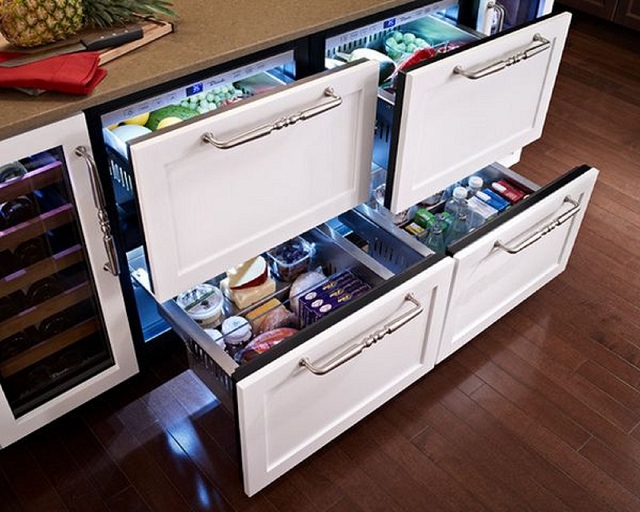 You can even add freezer drawers or wine refrigerators if you’d like. It’s perfect for keeping cold food right near your prep area. 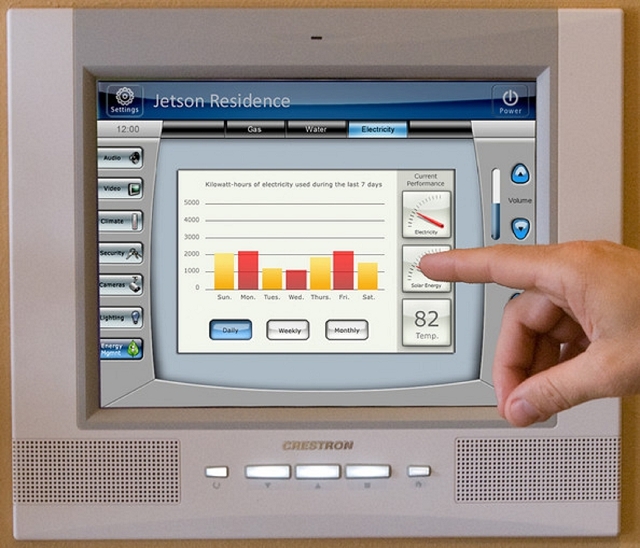 See exactly how your home is using energy with this dashboard and use it to improve energy performance. It records your home’s energy consumption data and automatically adjusts your home’s use of energy by changing heating and cooling temperatures, turning off idle appliances, and dimming lights. 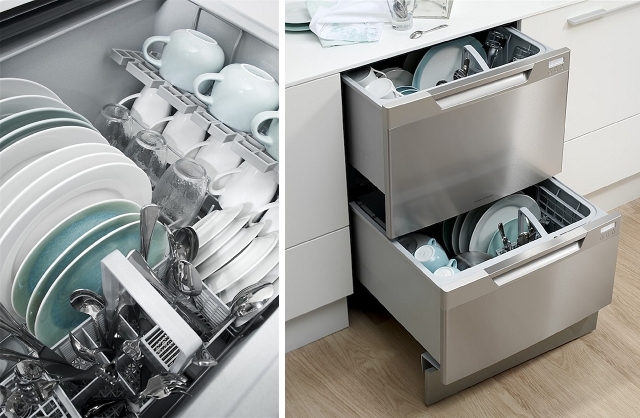 Small households that don’t need to run full dishwasher loads daily can benefit from these dishwasher drawers that allow you to wash small loads as efficiently as large ones. They’re also great for those who don’t want to bend over to load large traditional dishwashers. 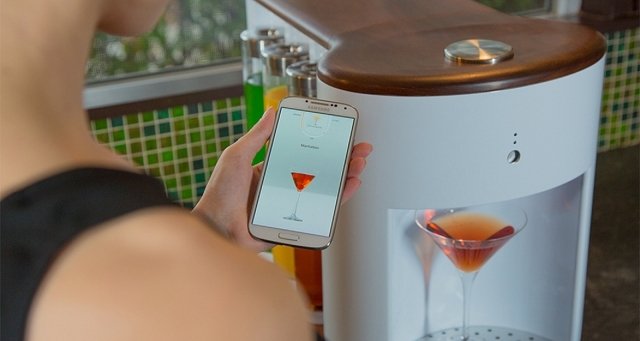 If you love craft cocktails, but don’t know how to make them all, let this appliance be your personal bartender. All you have to do is select a drink, customize ingredients and alcohol content, and enjoy. Use this special spice pen to create decorations on food, desserts, coffee, and more. Fill it with cinnamon or other spices for a fun, decorative kick that is fun and easy to use. 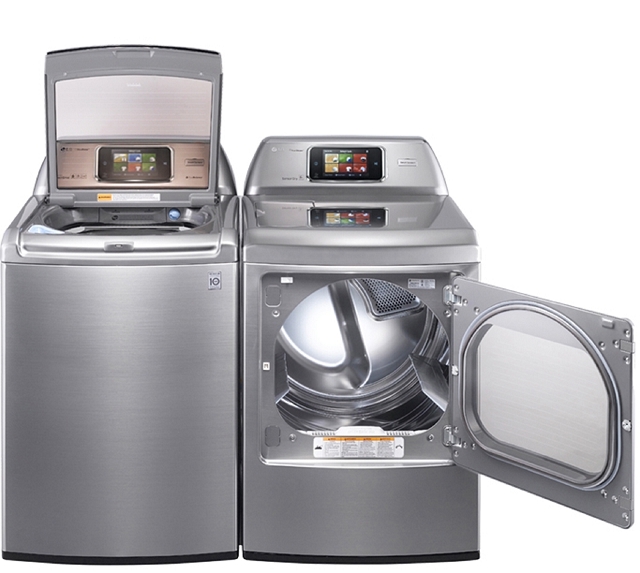 These smart washers and dryers make it possible to download custom cycles, set up remote monitoring, and control the start time of wash cycles. Like the Smart Thinq washer and dryer, this refrigerator comes with next generation features including a food manager with expiration dates, a shopping list tool, recipe search by ingredients in the refrigerator, a smart access refrigerator app, and more. Using this state of the art cooking range, you can monitor cooking progress and self cleaning cycles remotely. You can even use the LG Smart Access Range app to send recipes to your range to automatically set the temperature and cooking time. This portable appliance allows you to “smell” meat for quality and freshness without your nose. It will tell you if they are safe to eat and reduces the risk of food poisoning. The appliance is suitable for detecting freshness and health hazards of pork, beef, chicken, and fish. This faucet will take your sink to a new level of technology with a wireless digital controller. The controller can be placed in any location, and it tells you whether the water is cold or hot with a colored ring. If you’re in the middle of washing dishes and want to conserve water without adjusting your water temperature, simply press pause to save it. You can even set a memory function to save your settings. The flow of water stops after a pre set time as well to reduce water waste. Want to enjoy your coffee on tap? This appliance offers specialty coffee drinks with practically zero wait. 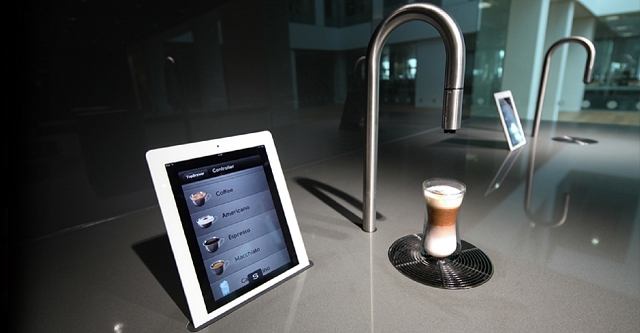 Use the app to select the type of coffee or specialty drink you’d like, and it will dispense it from the tap. With this learning thermostat, all you have to do is set it to a temperature you like, and it will learn your preferences and schedule so that it’s always a comfortable temperature. It even uses an auto away feature that turns to a more energy efficient away temperature when you’re gone, and offers an app that allows you to control your home’s temperature from your phone. 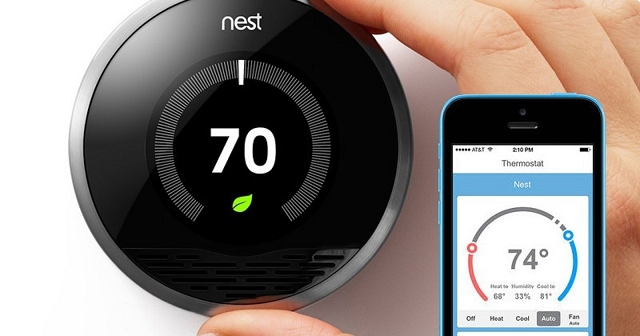 Nest’s smart carbon monoxide and smoke detector offers smart home protecting features. The alarm can send a message to your phone or tablet, and the app will let you check on your home at any time. The app has a What To Do feature that allows you to create a plan for family emergencies, and a safety history with the last 10 days of activity that’s helpful if you have a CO leak or an emergency. With most toasters, you can’t really tell how toasted your bread is until it pops up — leading to over toasting, burns, or under toasting. 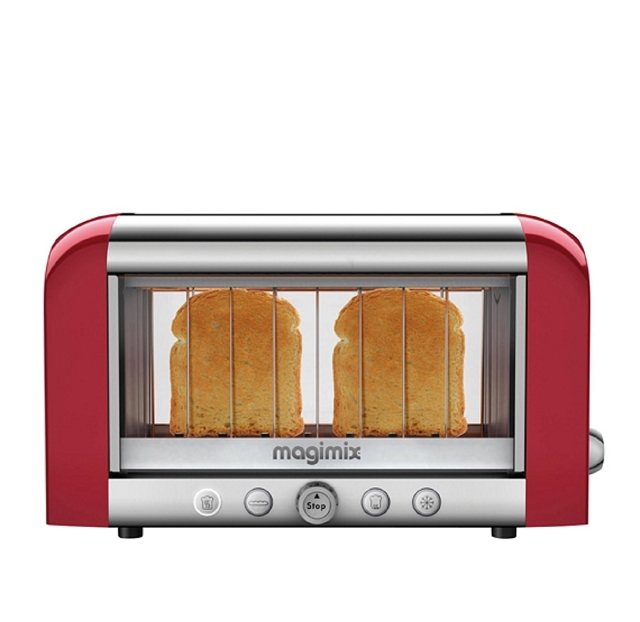 But with this toaster, you can actually see the level of toast and watch until it’s perfect. 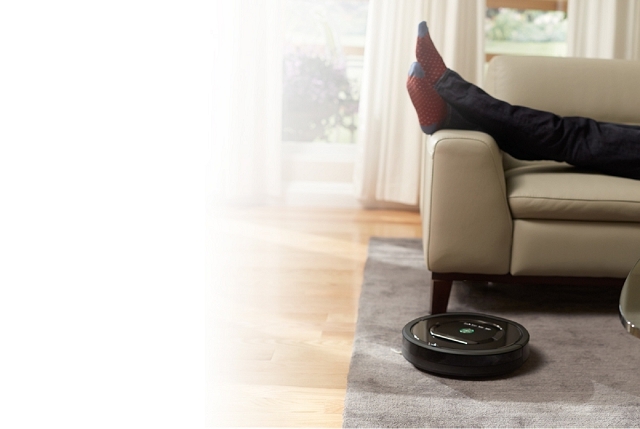 The Roomba robotic vacuum isn’t new, but it’s still unique. This household cleaning tool automates vacuuming to reduce your cleaning time and keep your floors clear. You can set it to clean on a schedule, automatically dock and recharge, and listen for indicators to know when the bin is full. 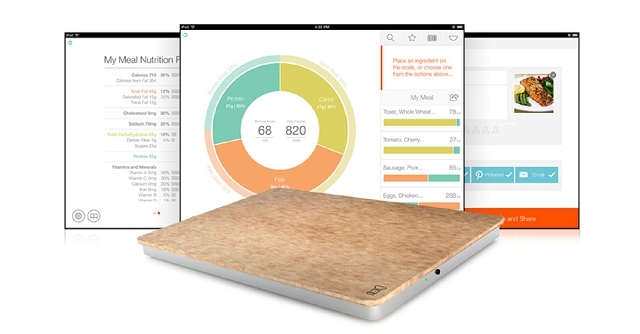 The Prep Pad is a smart food scale that helps you track your nutrition and health. The scale will give you a breakdown of carbs, protein, fats, and nutrients and help you to create balanced meals and track your progress. It also syncs with Jawbone Up, so you can track both nutrition and activity. Steaming is one of the healthiest ways to prepare your food, retaining more nutrients than other methods. 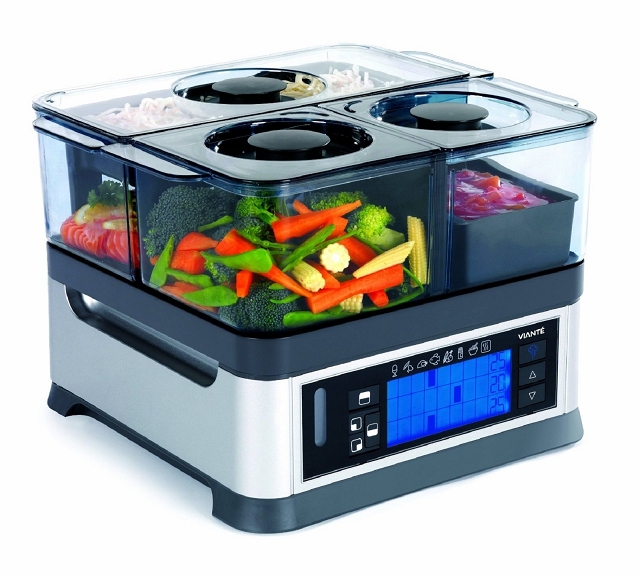 This steamer takes food steaming to an entirely new level with three separate food compartments with their own temperature and timer controls. You can also automatically set start times — so all foods will finish at the same time. 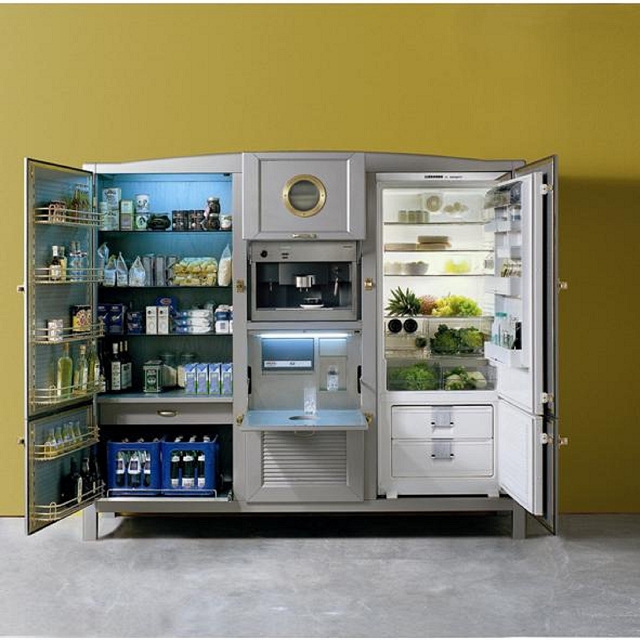 Who says refrigerators can’t be cool? 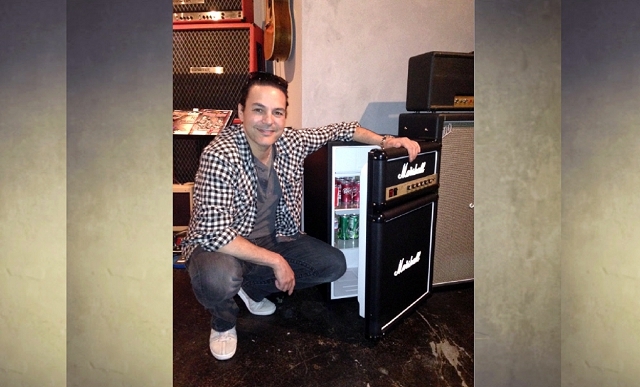 This refrigerator combines the style of Marshall amps with the convenience of a small refrigerator. It even comes complete with authentic Marshall control knobs that go to 11. It’s perfect for practice rooms, man caves, garages, and anywhere else you want to share your love of music and handy cool space. The Loft Wing fan is a cross between hand fans and electric fans. 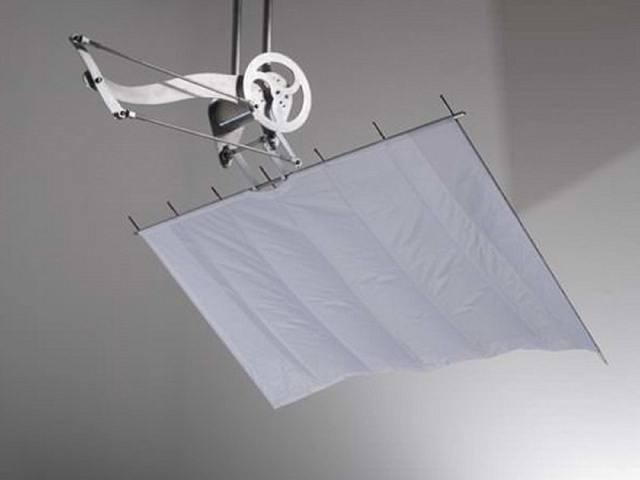 Using a large swath of fabric and electrical mechanism, it offers a strong fanned breeze that’s like a hand fan without all of the work. The fan is available in custom covers and is suspended in your ceiling — custom mounts are available for any ceiling configuration. It is eco friendly, using less energy than a conventional fan, and is an attractive modern design. Unlike regular fans, the Dyson air multiplier fan does not use visible blades for airflow. 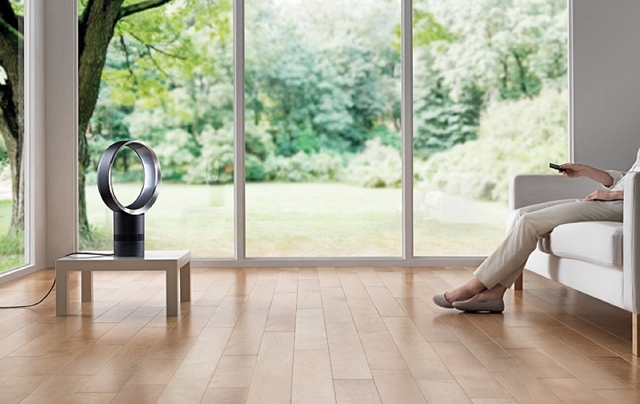 Dyson’s fan has a striking look, powerful airflow, and because it doesn’t use a slow running motor to spin blades, it’s 75% quieter than traditional fans and even uses significantly less energy. The fan is available with a sleep timer and remote control, and without blades, it’s safe and easy to clean. With this Wifi enabled kettle that works with your smart phone, you can put the kettle on with your phone from anywhere in your home. 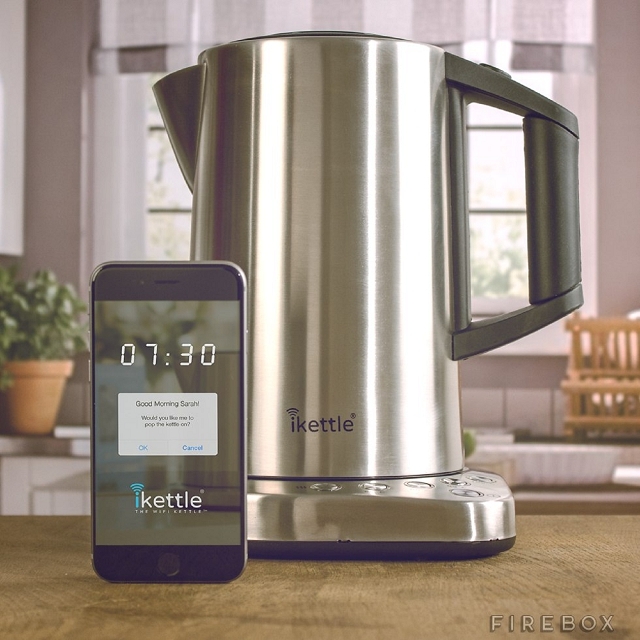 The kettle’s app can pop up to ask you if you’d like to put the kettle on when you arrive home, and you can set it for a friendly wake up call request to put it on in the morning. And if you’re not quite ready to get up yet, don’t worry. When the iKettle is boiling it will ask if you’re ready now or if you’d like it to stay warm for up to half an hour. Homebrewing is a fun way to make and enjoy your own beer at home, but it often requires complicated setups, especially if you want to brew using all grain instead of extract. 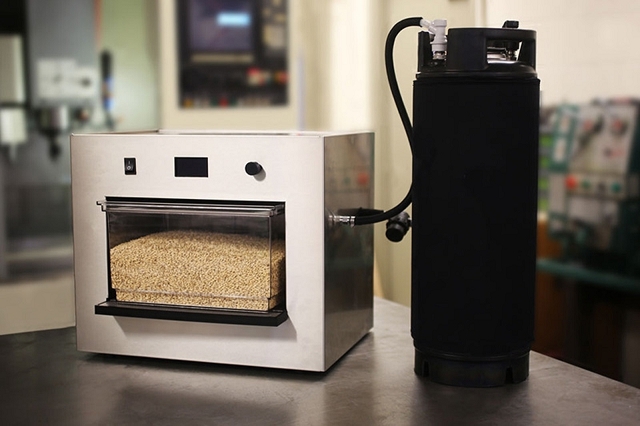 With the PicoBrew Zymatic Machine, the home brewing process is completely automated and consistent. You can choose from over 100 different beer recipes, or create your own as many times as you want with just the push of a button. The Airocide air purifier is unlike any other air purifier out on the market. It uses NASA technology and is FDA listed as a Class II Medical Device designed to clean your home’s air and help you feel better. While traditional air filters trap airborne organic matter, the Airocide destroys them — and also eliminates even the smallest of gases. Cooked eggs usually aren’t cylinder shaped, but the Rollie presents a good case for eating them that way. The Rollie uses vertical cooking technology that makes it easy to enjoy a perfectly cooked egg within minutes with no mess. Plus, the appliance can be used to make burritos, pizza rollies, cinnamon rollies and other easy pop up treats. This insect killer attracts mosquitoes and other pesky insects, kills them, and looks good doing it. It simulates human body temperature and generates CO2 to lure insects into the container and removes them from the area. This insect killer is noted for its sleek, innovative design. This isn’t just any toaster oven: this toaster oven uses a double infrared light to cook up to 40% faster than conventional toaster oven. It also features smart automatic cooking time function heat and control for a variety of foods, with presets for toast, pizza, frozen foods, and quick reheating. It looks a bit like a blender, but does so much more. 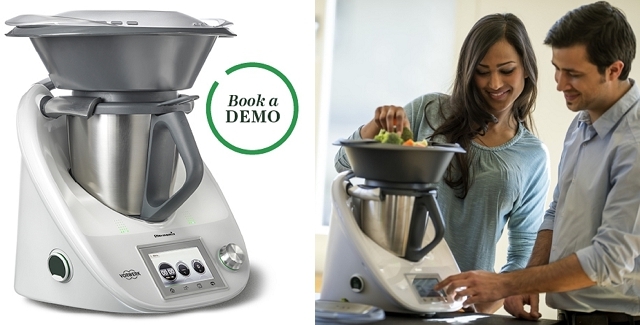 The Thermomix is an all in one kitchen appliance that has multiple functions, including weighing, mixing, chopping, blending, steaming, heating, stirring, and cooking. It’s perfect for automated cooking with a recipe chip that will take you step by step through recipes on screen as well. The Kuhl air conditioner is an advanced window unit cooling system that offers wireless controls. You can access your unit remotely, turning it on or off, creating schedules, and more. The unit is available as cooling only, heat pump, or cooling and heat. It has a customizable seven day schedule and a 2 hour timer. And if you have more than one unit, you can group them for zone or centralized control. 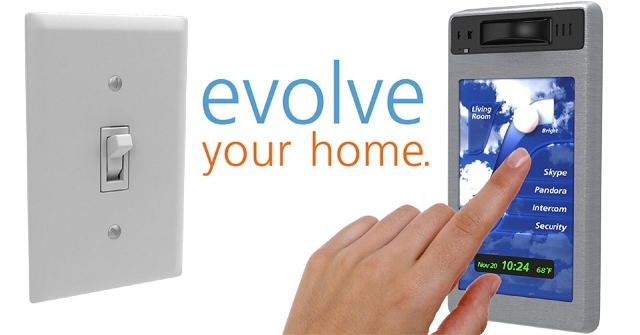 Want to get wireless access to your front door lock? Use Lockitron to pair your deadbolt lock with Bluetooth functionality that makes it easy for you to unlock your door without a key. You can share access with your phone app, and get peace of mind knowing when your door locks and unlocks: you’ll get notifications when any user unlocks the door using a phone or a key. You can even use Lockitron Sense to automatically unlock your door when you get home. This zone induction hob cooktop makes it possible for you to place your cookware anywhere you’d like — and the heat will follow. It is an advanced zoneless cooking area that can accommodate multiple cookware items at different heat levels. Mixed Up Jake’s mixers are customized, made to order Hobart mixers with unique, intriguing designs for each. 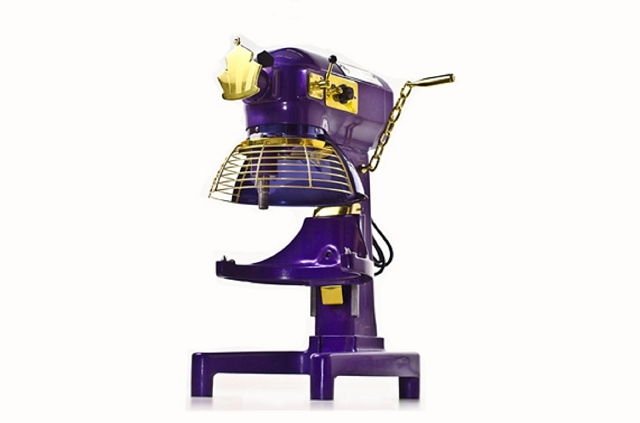 He has created beautiful customized mixers for professional chefs and home cooks alike. Each is creatively designed with the perfect color and graphics for each kitchen. If you’re serious about weight loss and health, this body analyzer offers advanced features you’ll enjoy. It measures weight, body composition, heart rate, and air quality to give you a comprehensive view of your health and fitness. 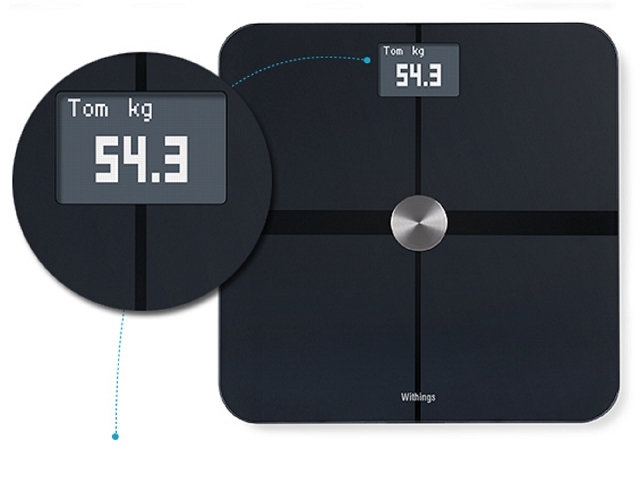 Get accurate weigh ins with position control, plus benefit from features including automatic user recognition and one stop tracking. This sous vide machine offers advanced features — including the ability to control hot and cold temperatures. But what really makes it unique is that you can teach it what you like, so it’s easier to cook every time. Use the Mellow app to give the machine orders through your smartphone. 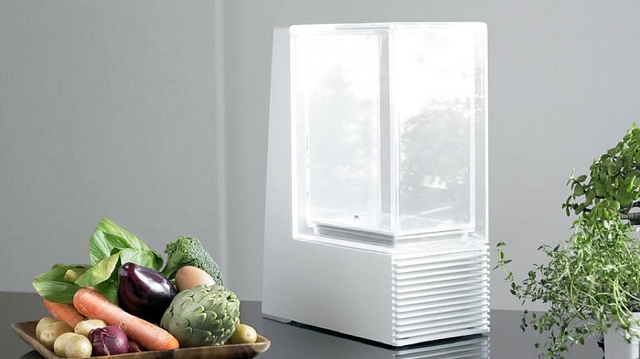 You can even keep your food at refrigeration temperatures, and then start cooking remotely. 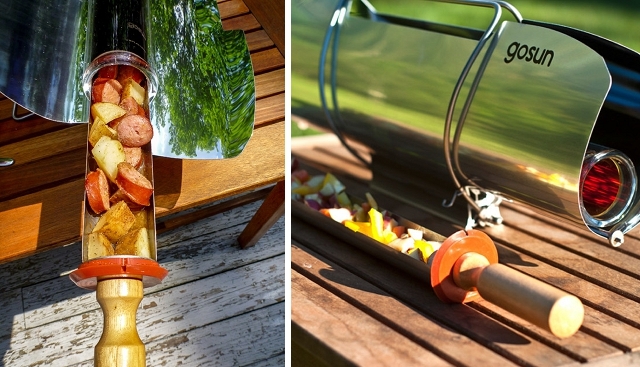 Want to cook outdoors without fuel or electricity? With the Go Sun stove, all you need is the sun to make a hot meal. It’s perfect for living off the grid, camping, hunting, and experimenting with outdoor cooking. This is the fastest solar cooker on the market with the ability to cook a meal in 20 minutes and reach temperatures higher than 550 degrees Fahrenheit. Germs are everywhere, but you can eliminate them with the flick of your wrist using this sanitizing want. With ultraviolet technology, the wand kills up to 99.9% of germs, viruses, and other microorganisms on non porous surfaces. It is perfect for sanitizing counter tops, bedding, upholstery, and more. 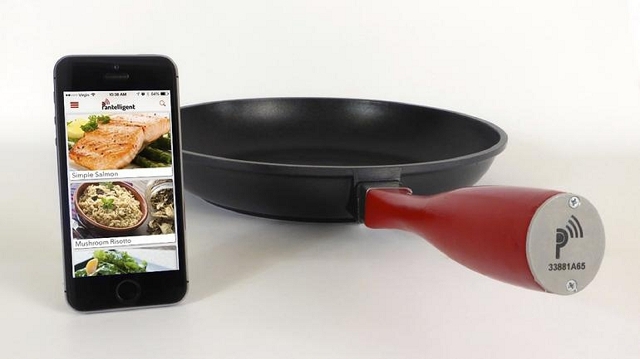 Using this smart frying pan, you can cook everything perfectly. It uses unique temperature control to make sure you never have overcooked, undercooked, or burned food. The pan knows when it’s reached the right temperature, when you should flip or stir food, and when food is done. You’ll use the app to tell it what you’re making, and the rest is perfect cooking. The Evak food storage containers use a unique design to “evacuate” air from the container, improving freshness to keep food fresher longer. When you push down the lid, the system pushes air out. 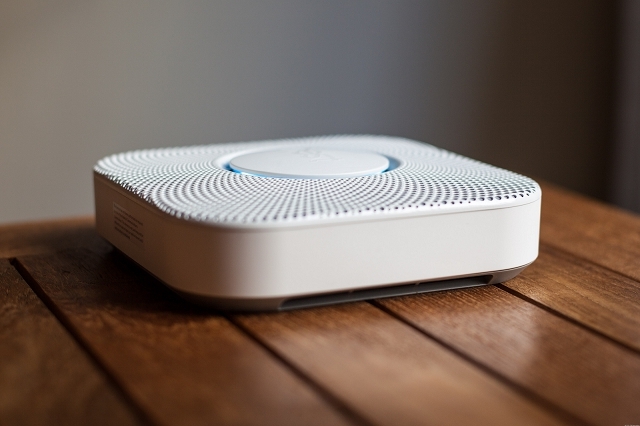 The Hello Sense is a sleep appliance that helps you understand your sleep and bedroom environment. The Sense sits on your bedside table and uses the data of the environment in your bedroom along with your sleep patterns to give you insight into how well you’re sleeping. It will give you a sleep score, and can even help you to identify problem patterns in your sleep, disturbances, and anything that’s keeping you from getting a great night’s sleep. The Sentri is a comprehensive home monitoring system that allows you to check in on and get alerts for your home anywhere you are. It has personalized alerts and a live video feed to keep you informed, plus, it works with other appliances like Nest and Lockitron to automate your home. You’ll be able to use environmental sensors, motion detection, automatic presets, and pre programmed alerts to automate and get alerted to the things you care about most in your home. The bRight Switch offers an entirely new take on the classic light switch. In addition to light controls, the bRight Switch offers touch selections for security, music and communication apps, intercom, video chatting, and more. Switches are Z-Wave and Wifi compatible, so you can control your switch from anywhere you have access to the Internet. Plus, you can make it your own with customizable wallpapers — including a family photo. Whether you’re ready to upgrade your fan, kitchen appliances, security system, or even your light switch, it’s clear that there are many exciting and unique new appliances available. Which unique appliance are you most interested in?